Whisky refers to a group of alcoholic beverages (liquors) distilled from fermented cereal grains such as barley, rye, wheat or maize. The word derives from the Gaelic uisge beatha - water of life. (c.f. eau de vie for French spirits, aqua vitae in Italian, aquavit or akvavit in Scandinavian and okovita (vodka) in Poland and the Ukraine). The conventional spelling is whisky for spirits distilled in Scotland, Wales, Japan, Australia and Canada while whiskey is used for spirits from Ireland and the USA. 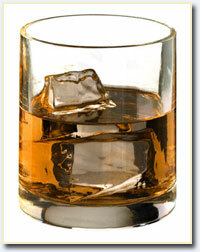 Known as "Scotch" there are two main types, Malt and Grain. Many popular brands are a blend of each type. Malt whisky is made from malted barley and distilled in a pot still. Malt whiskies may be single and come from one distillery (such as Glenfiddich, Glenmorangie or Highland Park) or vatted - a blend of malts from several distilleries (Johnny Walker Blue Label). Single malt whiskies are normally the choice of whisky connoisseurs with different regions of Scotland producing notably different styles and a range of complex flavours. Grain whiskies are made from unmalted cereals and fermented in a continuous distillation process. Generally grain whiskies are blended with unnamed malts to supply the cheaper end of the market (Bells, Teachers, Famous Grouse, Johnny Walker Red Label). Blended whiskies are mostly used in mixed drinks, for example a "Scotch and American" (Whisky and dry ginger ale). Connoisseurs of fine malt Scotch will drink their whisky in a heavy based glass (usually lead crystal) either neat or with a very small splash of cold still water to help release the flavours. The addition of ice ("Scotch on the rocks") is frowned upon as it destroys the flavour. Moonshine, or home-made whiskey, has been a fixture of life in the Southern U.S.A for centuries. However, there was a surge of illicit moonshine production during prohibition throughout the entire country. Moonshine did, and continues to, cause many health problems, aside from alcoholism itself. Bourbon Whiskey is a uniquely American spirit, distilled from corn. True Bourbon can only be made in Kentucky but Bourbon-style Whiskey is made across the United States, and even across the world. Downard, William L. Dictionary of the History of the American Brewing and Distilling Industries. (1980). 268 pp. This page was last modified on 3 January 2018, at 13:20. This page has been accessed 71,185 times.